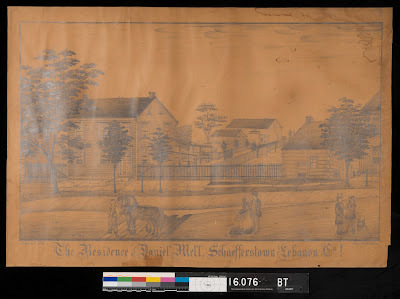 The purpose of this page is to promote understanding of the causes of the darkening and deterioration of Brader drawings, and to show the results of the professional conservation treatment on some of the drawings. "One cannot overestimate the importance of these drawings." "I would caution people from making their drawings worse by home remedies like erasers and adhesive tape and if they can’t afford conservation to at least consider conservation matting and refitting with conservation backing boards. Owners often try to unroll a brittle drawing which needs to be done by a professional to avoid splits in the brittle fibers. This unrolling is even tricky for professionals and can take time, experience and patience." Read detailed explanation of conservation treatment at McKay Lodge HERE. vertical dark stains caused by open splits in the frame's original wood back. AFTER: Aqueous treatment has removed a good amount of the discoloration. Black spacer has been installed along the edge of glazing. Bob, why are these drawings slowly turning so dark? The sometimes extreme discoloration, or browning, of the papers sheets on which Ferdinand Brader drew would have multiple causes. For one, though they may vary in manufacture according to his local buying, it may be assumed that these sheets of “cartridge paper” were all made from wood pulp, perhaps varying from the crudest mechanical grinding of wood to a suitable pulp to more sophisticated chemical treatment and pulp cooking processes. Thus, at the start, the papers were, we can say with certainty, acidic. Acids in paper eventually destroys paper. Are there other contributing factors? For some of the sheets at least, Ferdinand Brader apparently supplied outside acids by “sizing” his finished drawings with a brush wash of buttermilk – this having a pH reading of acidity as low as 4.4. and an upper common limit of 4.8. What about those wood back boards? 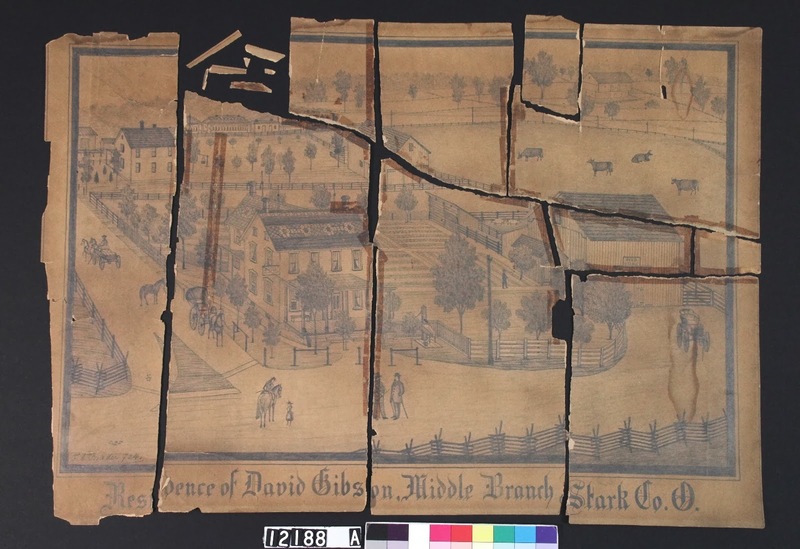 The next attack on his papers was the common 19th century framing method where the back of a framed paper art work was closed with very thin pieces of knotty, rough sawn, wood. Often that wood, which is acidic, was in direct contact with the back of the paper. So, the acid is destroying the paper. Is there any way to stop that? Fortunately, both the browning of most papers and some of the accumulated acids are water soluble and if the surface media can withstand aqueous treatments, removal of undesirable brown color and some of the acids can be accomplished at once. Such aqueous treatments provide the dual benefit of removal of acids that would continue to degrade the paper and the removal of some extent of the browning. What can an owner do? For survival, every discolored Brader drawing needs to undergo aqueous treatments for the removal of accumulated acids. This is not something everyone may be able to afford. Those who do nothing leave their Brader drawings on a path of destruction. Minimally, a darkened Brader drawing should be kept in the dark, in a cool and low humidity environment, and off the floor and in an active area to discourage silverfish. 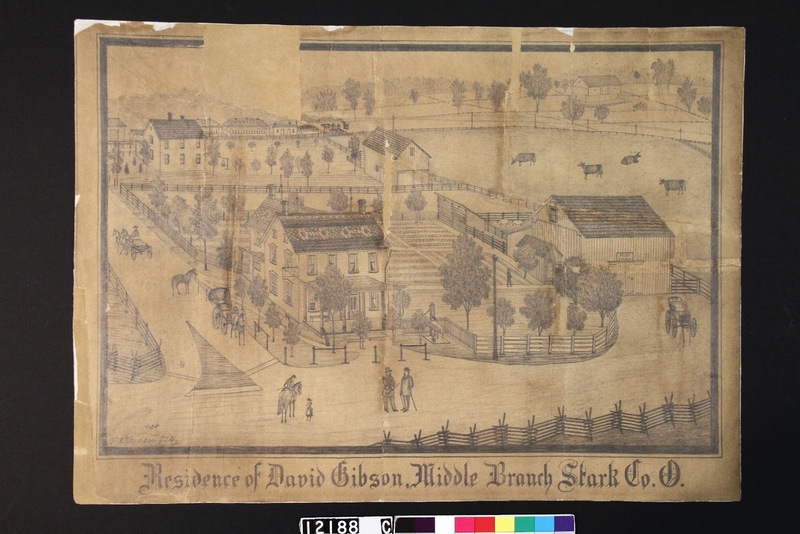 This drawing of the Residence of David Gibson is owned by Larry Coley, great grandson of Daniel Gibson. 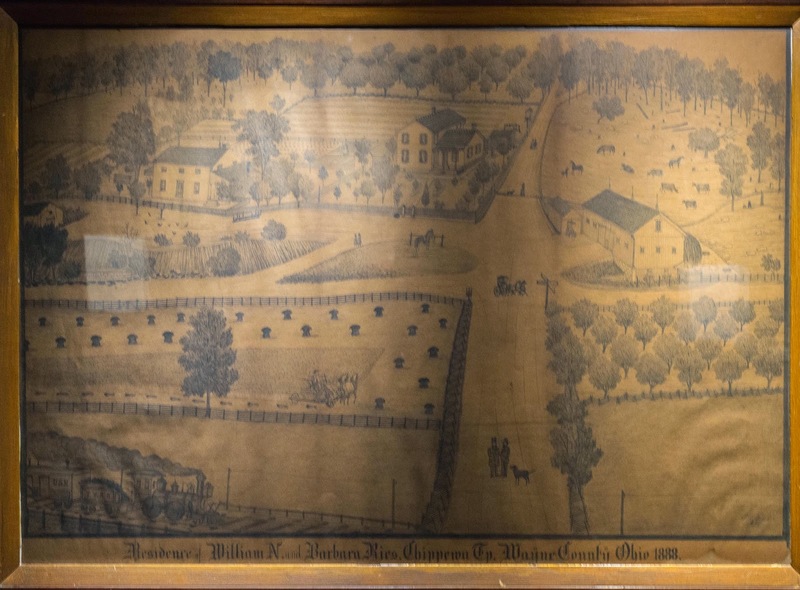 The Gibson family had a general store across the street from the house, and their story is that Brader drew this from its second floor window. The house still stands at 7569 Middlebranch Road, Canton, Ohio. The drawing has deteriorated and shows what will happen to any drawing that has not been treated. The acids present in the wood pulp of the paper cause overall darkening, tears and disintegration into pieces. There are several factors at work here, including the wooden backing used in frames of this period, which is also highly acidic, as are humidity, light, and the buttermilk with which Brader apparently "finished" his drawings. preservation and conservation of our cultural heritage. If you cannot afford conservation, consider conservation matting and refitting with conservation backing boards. Here are the names of frame shops where Brader drawings have been refitted with acid-free backing. If you can make additional recommendations for conservators and framers, please contact us so that we may add to this list. Chippewa-Rogues Hollow Historical Society plans to conserve their two drawings! Residence of William N. and Barbara Ries. Chippewa Tp. Waÿne Countÿ Ohio 1888. A fun fund-raiser at Silver Wine Winery, which provided the wine pairings for the specially prepared small plates, a silent auction of overflowing baskets, an Antiques Rogue Show by auctioneer Eric Pandrea. The April 2015 event, organized beautifully and enthusiastically by Mary Mertic and her colleagues, was a huge success. © 2017 Center for the Study of Art in Rural America, Inc. All rights reserved. With meticulous care, Ferdinand Brader identified the owners and township of each property he visited and used a sequential numbering and dating system which helps scholars date the drawings. Research is underway to catalog the drawings as more examples of his work become known. Currently only a fraction of the estimated 980 total landscape portraits have been cataloged. 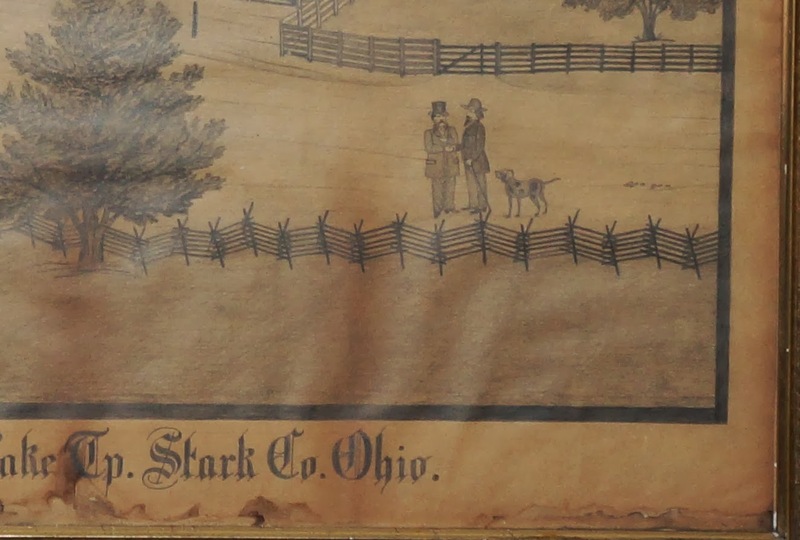 We need your help to identify the drawings and trace Brader's path through Pennsylvania and Ohio. This list of identified landscape drawings has been prepared with gratitude to all the collectors who so generously share images of their drawings and tell us the stories behind them. Remembering that at the beginning of this project the number of listed drawings was 122, just look at what we have done together. 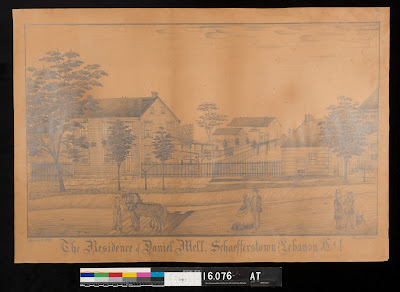 To see a list of the drawings which have been discovered recently, click HERE. To see the map with locations of the farms which Brader drew, click HERE. now include the book in their collection. Sister M. Protasia Hofstetter, F.M.I. ...and always, great appreciation of all the anonymous private collectors who so generously share images of their drawings and tell us the stories behind them.